A typewritten document or other text. 1. Conforming to a type: "She is the typical, or normal, American." 2. Exhibiting the qualities or characteristics that identify a group, kind, or category: "He is the typical British guy." 3. Of a feature that helps to distinguish a person or thing: "That is typical of you!" 4. Etymology: from 1605, "symbolic, emblematic," from Middle Latin typicalis, "symbolic"; from Late Latin typicus "of or pertaining to a type"; from Greek typikos, from typos, "impression". 1. Errors of spelling, grammar, etc. that are made when typing or printing a document: Carol spotted several typos in the page that she was editing. A typo includes errors resulting from mechanical failures or slips of the hand or finger, but essentially it shouldn't include mistakes made as a result of a lack of knowledge. Although a typo excludes errors of ignorance, it is common to find it being used as a euphemism to describe instances of poor spelling, punctuation, or grammar. 2. 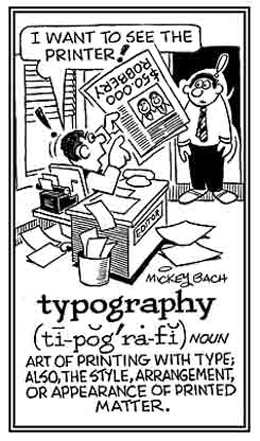 Etymology: an abbreviated term for typographical, from Middle Latin typographia which came from Greek typos, "dent, impression, mark, figure, original form" + -grapheia, "writing". A record from a machine that sets type or casts lines of type and sets them. A machine for setting type, or for casting lines of type, and setting them. 1. Someone who processes printing; especially, the setting and arrangement of types and printing of documents, etc. 2. Anyone who arranges and produces the appearance of printed matter. A reference to the action, or process, of printing. 1. The action or process of printing; especially, the setting and arrangement of types and printing from them: When Ivan was in school, he studied typography as part of his graphic arts course. 2. The arrangement and appearance of printed matter: The typography on the front page of the newspaper was eye-catching. © ALL rights are reserved. Inter-related cross references, directly or indirectly, involving word units dealing with "form, shape, appearance": eido-; figur-; form-; icono-; ideo-; imag-; morpho-; -oid. Showing page 6 out of 7 pages of 97 main-word entries or main-word-entry groups.